West Lake Tahoe Real Estate has a lot of “old Tahoe charm”. It is the area south of Tahoe City down to scenic Rubicon Bay. Here you can ride your bike on the bike trail that spans miles of lakefront real estate. West Lake Tahoe real estate also offers few lakefront restaurants and a Homewood ski resort for your enjoyment. North Lake Tahoe Real Estate includes the area north of Tahoe City to Kings Beach. North Lake Tahoe offers choice of condominiums including lakefront condos. 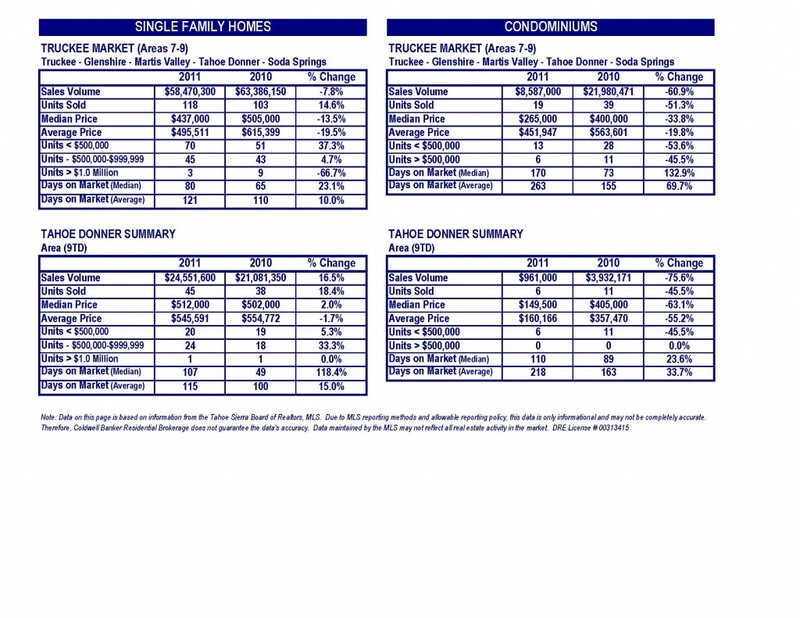 Lake Tahoe Real Estate Market Report: May 2.-May 8. Active Listings: The active inventory for residential and lot Truckee real estate and Lake Tahoe real estate listings increased nicely from 1,568 the previous week to 1,592 active listings in the market; 1,095 residential Lake Tahoe properties and 497 lots and land listed for sale. As is typical in the spring, more homeowners begin to place their Truckee real estate and Lake Tahoe real estate back on the market for the summer selling season. Coldwell Banker has over 15% of the active listings in the market. Lake Tahoe foreclosures REO-Lake Tahoe Short Sale Listings: Of the active listings, there are 164 properties listed as Lake Tahoe short sales, (10.3%) and 45 properties listed as Lake Tahoe foreclosures REO sales, (3.1%). Months of Inventory: Based on the current inventory and sales for the previous 30-day period, the market has over 15-months of inventory available. The inventory of Lake Tahoe real estate at today’s prices continues to favor the buyer interested in an investment property, vacation home or moving up to a larger Lake Tahoe home or better location. Sales: For 2011, there have been 395 Lake Tahoe real estate sold in the market as compared to 432 for the same period in 2010 which is an (8.6%) decrease in sales. Lake Tahoe foreclosures REO & Short Sales: Of the properties sold, 103 have been Lake Tahoe foreclosures REO’s, (26.1%), and 56 have been Lake Tahoe Short Sales, (14.2%) which results in over 40% of the properties sold being a distressed property. In 2010 for the same period, there were 102 Lake Tahoe foreclosures REO sales and 61 Lake Tahoe short sales or roughly 38% of the total sales. Price Range: For the year, there have been 274 Lake Tahoe real estate sold priced below $500,000, 93 properties sold between $500,000 and $1,000,000 and 28 properties sold over $1,000,000. Median and Average Sales Prices:The median sales price for Truckee real estate and Lake Tahoe real estate sold year to date is $365,000 while the average Lake Tahoe real estate sales price is $478,628. For the same period in 2010, the median Lake Tahoe real estate sales price was $400,000 and the average sales price was $525,491 which is an (8.8%) and (8.9%) decline in price respectively year over year. Last Week’s Lake Tahoe Real Estate Sales: For the week of May 2nd a total of 14 properties sold which was down sharply from the previous week’s sales of 27 properties. Of the properties sold last week, two (2) of the properties sold were priced over $750,000. Pending Sales: Currently there are 160 pending Truckee real estate and Lake Tahoe real estate sales in the market which is up slightly from the previous week. Of the pending sales, 10 are Lake Tahoe short sales and 21 are Lake Tahoe foreclosures REO properties. Truckee real estate and Lake Tahoe real estate sales for the first week of May were the third lowest week this year in terms of closed transactions. This very well may be because of the beginning of the month which tends to be slower but compared to last year sales for the same week were 24 transactions. Overall Lake Tahoe real estate and Truckee real estate sales year to date as compared to last year are down 8.6% from 432 sales in 2010 versus 395 sales in 2011. The hottest segment of the market continues to be homes priced under $500,000 as roughly 69% or 274 properties have sold in this price range. Sales of homes priced above $1,000,000 continue to lag behind 2010 sales in this price range as 28 properties have sold year to date as compared to 42 properties last year. The mid range market sales, $500,000 to $1,000,000 are down slightly from last year with 93 properties sold or 24% of the total sales as compared to 115 properties sold in 2010. Distressed properties, Lake Tahoe foreclosures REO and Lake Tahoe Short Sales represent 40% of the sales in the market which is almost identical to Lake Tahoe foreclosures REO and Lake Tahoe Short sales in 2010. However, there is still considerable interest in non distressed properties as many are priced at levels that are too good to pass up. Median Truckee and Lake Tahoe real estate sales prices have decreased by 8.8% to $365,000 while the average Truckee real estate and Lake Tahoe real estate sales prices have decreased by 8.9% to $525,491. While other parts of California are reporting median prices stabilizing or increasing slightly, that is not the case thus far in the Lake Tahoe real estate -Truckee real estate market. All in all, with the existing inventory levels, the lower median and average sales prices, favorable interest rates available to qualified Buyers, now may be the right time for that investment in a vacation home or investment property especially before the spring. 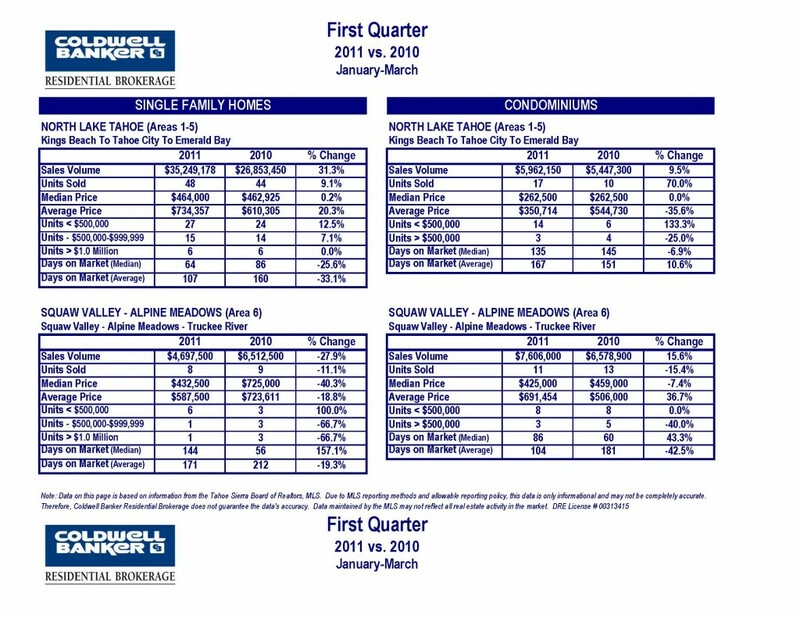 Lake Tahoe Real Estate and Truckee Real Estate 1st Quarter 2011 Vs 2010 Real Estate Market Statistics. 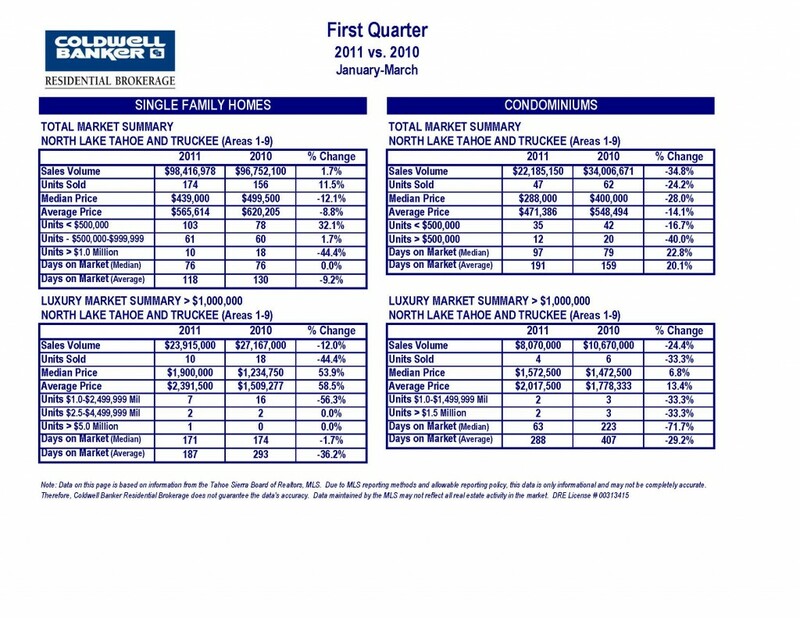 Lake Tahoe real estate and Truckee real estate single family and condominium sales 2011 vs. 2010. Information taken from Lake Tahoe MLS. Lake Tahoe Real Estate Market Report: Apr 25. – May 1. Active Lake Tahoe Real Estate Listings: The active inventory for residential and lot Lake Tahoe Real Estate listings went up slightly from 1,547 the previous week to 1,568 active Lake Tahoe Real Estate listings in the market; 1,081 residential Lake Tahoe Real Estate and 487 lots and land listed for sale. Coldwell Banker has over 15% of the active Lake Tahoe Real Estate listings in the market. Lake Tahoe Foreclosures (REO)-Short Sale Listings: Of the active listings, there are 165 properties listed as Lake Tahoe short sales, (10.5%) and 45 properties listed as Lake Tahoe Foreclosures (REO) sales, (2.9%). Months of Inventory: Based on the current inventory and Lake Tahoe Real Estate sales for the previous 30-day period, the market has over 13.5-months of inventory available. The inventory of Lake Tahoe properties and land at today’s prices continues to favor the buyer interested in an investment Lake Tahoe Real Estate, Lake Tahoe vacation property or moving up to a larger home or better location. For 2011, there have been 375 Truckee and Lake Tahoe Real Estate sold in the market as compared to 408 for the same period in 2010 which is a (8.1%) decrease in sales. Of the Truckee and Lake Tahoe Real Estate sold, 99 have been Lake Tahoe foreclosures (REO’s), (26.4%), and 51 have been Lake Tahoe Short Sales, (13.6%) which results in 40% of the properties sold being a distressed property. In 2010 for the same period, there were 100 Lake Tahoe foreclosures (REO) sales and 60 Lake Tahoe short sales or 39% of the total Lake Tahoe Real Estate sales. For the year, there have been 259 Truckee and Lake Tahoe Real Estate sold priced below $500,000, 89 Lake Tahoe Real Estate sold between $500,000 and $1,000,000 and 27 properties sold over $1,000,000. The median Truckee Real Estate and Lake Tahoe Real Estate sales price for properties sold year to date was $365,000 and the average Truckee and Lake Tahoe Real Estate sales price went up slightly to $482,530. For the same period in 2010, the median sales price was $400,000 and the average sales price was $514,503 which is an (8.8%) and (6.2%) decline in price respectively year over year. Last Week’s Lake Tahoe Real Estate and Truckee Real Estate Sales: For the week of April 25th a total of 27 Lake Tahoe Real Estate sold which went up nicely from the previous week’s sales of 21 Lake Tahoe Real Estate. Of the Lake Tahoe Real Estate sold last week, five (5) of the properties sold were priced over $750,000. Pending Lake Tahoe Real Estate and Truckee Real Estate Sales: Currently there are 151 pending Lake Tahoe Real Estate sales in the market which is up slightly from the previous week with 14 being a Lake Tahoe short sale and 22 being Lake Tahoe foreclosures REO properties. The last week of April saw Truckee Real Estate and Lake Tahoe Real Estate sales rebound from the two preceding weeks to 27 properties closing escrow. April Lake Tahoe Real Estate sales for 2011 were off by 27 sales for the month as compared to April Lake Tahoe Real Estate sales in 2010. Because of the slower sales in April, overall Lake Tahoe Real Estate sales year to date as compared to last year are down 8.1% from 408 sales in 2010 versus 375 sales in 2011. The hottest segment of the market continues to be Lake Tahoe Real Estate priced under $500,000 as roughly 69% or 259 properties have sold in this price range. Sales of Lake Tahoe Luxury homes priced above $1,000,000 have gained nicely in the last 45 days but continued to be off from last year as 27 Lake Tahoe Luxury homes have sold year to date in this price range as compared to 37 Lake Tahoe Luxury homes last year. The mid range market sales, $500,000 to $1,000,000 are down slightly from last year with 89 properties sold or 24% of the total sales. Distressed properties, Lake Tahoe foreclosures REO and Lake Tahoe Short Sales represent 40% of the Lake Tahoe Real Estate sales in the market which is almost identical to Lake Tahoe foreclosure REO and Lake Tahoe Short sales in 2010. However, there is still considerable interest in non distressed properties as many are priced at levels that are too good to pass up. Median Lake Tahoe Real Estate sales prices have decreased by 8.8% to $365,000 while the average Lake Tahoe Real Estate sales prices have decreased by 6.2% to $482,530. While other parts of California are reporting median prices stabilizing or increasing slightly, that is not the case across the board in the Lake Tahoe Real Estate-Truckee Real Estate market. All in all, with the existing inventory levels, the lower median and average Lake Tahoe Real Estate sales prices, favorable interest rates available to qualified Buyers, now may be the right time for that investment in a vacation home or investment property especially before the spring.